On the two-year anniversary of the devastating January 12, 2010, earthquake in Haiti, conditions in the remaining 800 earthquake displacement camps are deteriorating. The country faces the worst cholera epidemic in the world, as Amy Senier's post above details. Women and girls living in camps fear for their safety as they search for food, water and latrines in the day and as they fall asleep at night. 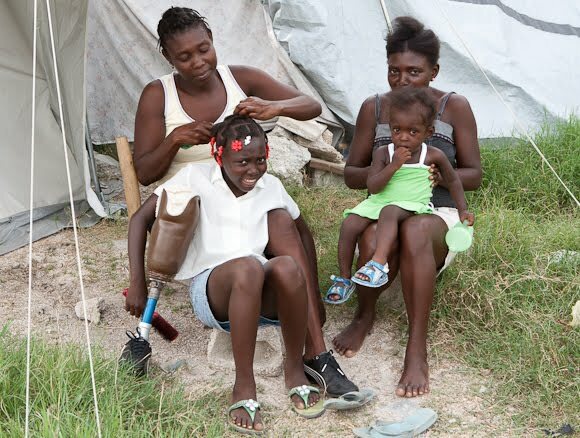 For two years now, Haitians have been urging their government and the international community to view earthquake survivors as rights holders, not charity cases, and to integrate a rights-based approach to recovery. Instead, Haitians at all levels have found themselves left out of the decision-making processes on aid distribution – from top government officials, overwhelmed by the “republic of NGOs” operating in their country, to the communities left homeless by the earthquake and struggling to survive. A coalition of 57 grassroots groups, internally displaced persons camps, nongovernmental organizations, and academic institutions took their grievances against the Haitian government and the international community to the United Nations Human Rights Council on October 13, 2011, when Haiti was reviewed under the Universal Periodic Review. Established in 2006, the Universal Periodic Review is a process that all UN member countries undergo every four years, during which the Council reviews each country’s human rights record in light of its obligations under the UN Charter, the Universal Declaration of Human Rights, other human rights instruments, and the country’s own stated commitments. (Prior IntLawGrrls posts.) Haiti’s review was postponed due to the earthquake, and it was the last country to be reviewed in the Universal Periodic Review’s four-year cycle. In preparation for the October hearing in Geneva, Switzerland, the coalition, with the help of the Institute for Justice & Democracy in Haiti and its Haitian affiliate, the Bureau des Avocats Internationaux, submitted thirteen written reports to the Human Rights Council on issues ranging from violations of the right to housing, violence against women and prison conditions to the responsibility to implement a rights-based approach throughout Haiti’s rebuilding after the earthquake. Collectively, the reports made 147 recommendations to the Government of Haiti and members of the international community active in Haiti on concrete steps they should take to improve human rights over the next four years, when Haiti will be reviewed under the Universal Periodic Review again. Though influence of the final government recommendations is important, one of the primary goals of the Universal Periodic Review work has been to foster sustained grassroots advocacy. On this, the two of us have worked together. Nicole's organization, the Institute for Justice & Democracy in Haiti and the Bureau des Avocats Internationaux, along with the Penn Law Transnational Legal Clinic that Sarah directs, conducted several trainings in Port-au-Prince. The purpose was to help dozens of advocates identify not only core human rights priorities among civil society, but also the ways in which those priorities intersect with each other. ► Meaningful civil society engagement through domestic and international advocacy after the Universal Periodic Review to ensure a plan of action for implementing the recommendations that truly takes into consideration the concerns and priorities of the most affected communities. This level of civil society engagement with an international human rights mechanism is unprecedented for Haiti. It is also the first time that various communities affected by the earthquake organized as a coalition to bring their shared concerns to the international community. A coalition attended the October Universal Periodic Review in Geneva (right). Included were members of: the Institute for Justice & Democracy in Haiti and the Bureau des Avocats Internationaux; Penn Law's Transnational Legal Clinic; Human Rights Advocates; MADRE; the City University of New York; the University of California Haiti Initiative; and the Center for Gender and Refugee Studies at the University of California Hastings College of Law. The coalition was hoping to bring advocates from Haitian grassroots groups, but unfortunately those groups could not get travel visas for Switzerland in time, and so were not able to come. This is a good example of the many barriers for Haitian civil society to participate at the United Nations. With 80% of the population living on under $2 a day, getting to the United Nations is next to impossible, which means that the voices of those who are the victims of human rights violations are often not hear. Unfortunately, the Government of Haiti did not send a delegation to Geneva; rather, it sent two representatives from the UN permanent mission. But this did not stop the coalition’s lobbying efforts. Nor did it stop the Human Rights Council from making 136 recommendations to the Haitian government, the majority of which reflected recommendations from our coalition. Haiti will have a chance to consider the recommendations and report back during the Human Rights Council's upcoming March session. Our coalition hopes to bring representatives from civil society to attend that session, so that they may directly deliver an oral intervention before the Council. Once the Haitian government adopts recommendations, the real work begins. To ensure effective implementation of the recommendations, it is critical that those grassroots organizations that came together to file their grievances and make their recommendations in the coalitions’ reports, are heard by the government and the international community. The new Government of Haiti is just getting settled, and there is a tremendous amount of work to do in building Haiti to its full promise and in ensuring the realization of the fundamental human rights of all Haitians. The voices of those directly implicated by the Universal Periodic Review report and recommendations need to have seat at the table in setting priorities and developing plans of action for implementing those recommendations. Ultimately, the success of the Universal Periodic Review and the (re)building of Haiti rest on the collaborative participation of the government, all members of civil society, and international support that respects Haiti’s sovereignty and works to build the capacity of civil society and the Haitian government.